Global education technology provider Promethean® recently announced the launch of the UK Promethean Grant 2018. Following the phenomenal success of the initiative in 2017, the company has identified a demand in the education sector for a second Promethean Grant in the UK this year. Promethean has recognised that schools are increasingly faced with budget pressures and believes this should not prevent them from having access to the latest teaching technology. The Promethean Grant aims to give schools throughout UK an opportunity to win the latest ed tech in a creative competition. All Saints HwB in Preston was one of 30 schools chosen by judges to win an ActivPanel® in the 2017 UK Promethean Grant. 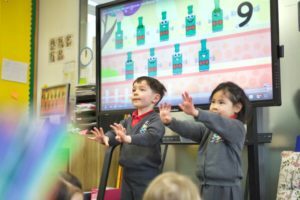 Rory Dixon, Year 3 Teacher and Computing Lead at All Saints HwB, said: “The Promethean Grant was an opportunity that we just couldn’t miss out on. As soon as I told the children about the competition, they came up with so many ideas and were very enthusiastic. In our class, we’re really passionate about using technology for learning. When I broke the news that we won, the children were in complete disbelief, but we were thrilled. We even had a party. To participate, schools are invited to submit video entries explaining why they would benefit from winning an ActivPanel – the latest interactive front of class display. Entries will be judged on three criterias: creativity, need, and the impact the technology will have if they are successful. 30 winners will be selected to receive a fully installed ActivPanel package valued at around £3,000. A maximum of one ActivPanel can be awarded per school, but multiple entries are welcomed. The competition opened on Monday 19th March and will close on Friday 15th June.